Radon is a colorless, odorless, tasteless gas that is naturally produced by the breakdown of uranium in the earth’s soil, which emits the radioactive gas into the air. When uranium breaks down, the radon gas rises from the ground and is able to travel into buildings through cracks in the foundation, construction joints, wall cracks, gaps around service pipes, and cavities inside walls. Each of these penetrations allow entry of radon gas. With nowhere to go once it is inside, radon concentrations increase until your home is unhealthy. Any building, anywhere in the U.S.—whether it’s a school, an office, or your home—can have a high radon level. Regions of Ohio have moderate to high levels of indoor exposure to radon. It is critical to test for radon. There are no symptoms or signs of this deadly killer. Radon is a tasteless, odorless, invisible gas that causes severe health problems over long term exposure. The only sure way to know if Radon is a problem in your home or business is to have the building tested. Learn more about our thorough process below. 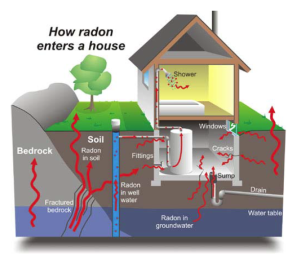 The Environmental Protection Agency publishes a guide to state radon offices (click here to view) as well as a citizens guide to radon (click here to view) that provides both location specific and general information regarding this toxic gas. Humans are primarily exposed to radon by breathing contaminated air, though in some cases, radon in groundwater may be ingested. When you breathe in radon, your lungs fill with radioactive particles that release small blasts of energy, which damage lung tissue. This increases your risk of lung cancer—and, when combined with smoking, can be deadly. The EPA estimates that up to 20,000-lung cancer deaths were caused or exacerbated by radon, particularly when combined with a history of smoking, making it the second most common cause of lung cancer, according to the Surgeon General. Children may also be unusually susceptible to radon poisoning, since they breathe at a faster rate and their cells are constantly dividing. Although there is no “safe” level of radon exposure, a level of 4 pCi/l (picocurries per litre of air) is when the EPA recommends taking action to remediate and secure your house from radon, exposes your family to more than eight times as much radiation than what the Nuclear Regulatory Commission would allow near a power plant. Estimates for houses with elevated radon levels range from one in 15 homes to one in five homes. At that same level, many scientists conclude that there is a one in 100 risk of death—a chance that no one should take. In addition to GreenStreet’s thorough home energy audit, our staff is a Licensed Radon Contractor in the state of Ohio. We are licensed to perform both testing and remediation services. Our testing procedure requires that the home or business is set to “closed home” conditions. Simply put, that means that the house should be set up as if it were winter with all doors and windows closed. We then determine the appropriate placement of our testing instrument (a small box that samples the air and registers radon content in the air samples) and once set up appropriately and engaged, the test equipment will remain in place for at least 48 hours. After the 48 hour period, our licensed technician will return to gather the test equipment and generate you a report that will provide information about the levels of radon in your home or business. If warranted, the technician can also discuss any mitigation options that may be necessary based on the test results. If a mitigation system is determined to be the correct course of action, we are licensed to install the solution. We use an Active Soil Depressurization process to remove the radon gas from under the foundation and route it outdoors above the roof line. This process significantly reduces the amount of radon that can penetrate through to the entry points outlined earlier. We can usually install a system in less than a day. Once a mitigation system is in place, we conduct another radon test to assure the system is preforming as expected. We recommend that each mitigation system is checked every other year and a radon test is conducted to assure continued system performance. For more information about GreenStreet’s radon service, please contact us at 1-888-476-2010.